Contact Homestead Woodworks - Beams Services - design, manufacture & install cabinetry & millwork - Kitchener, Waterloo, Cambridge, Guelph - Homestead Woodworks. For centuries, wooden beams have been used to support the structure of buildings. 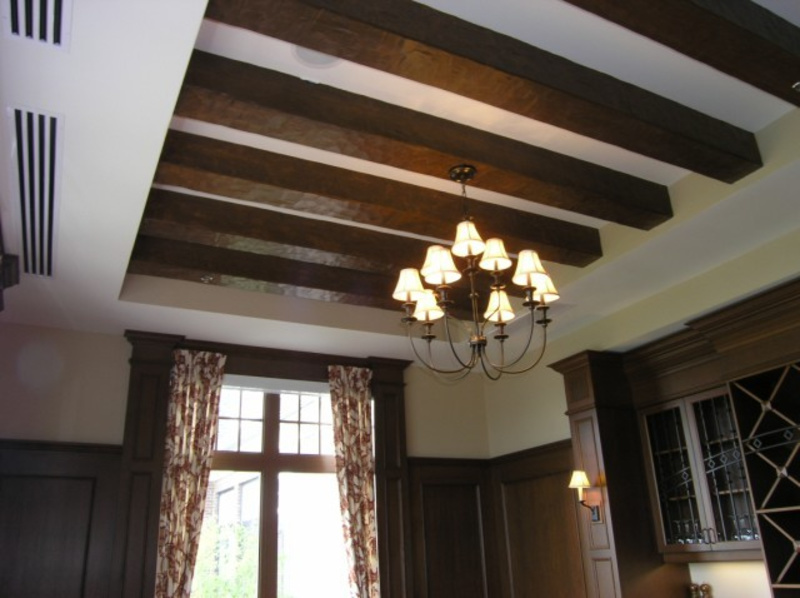 Although originally their main purpose was entirely structural, in more recent times beams have been used to create a distinct, warm, rustic feel or add a formal, more ornamental and decorative look found in coffered ceilings. Homestead's design team can assist you to achieve a look of French Country, Muskoka or any other style you want to create. A few beams can change a room from a basic painted drywall room to one that has life and character. Hollow beams with our popular lock miter joint, and hand adzing (a horizontal axe technique) can cover structural steel beams or framing members to have a very authentic look and feel of real wood timbers. The hollow beams will have less cracking than the solid beam. Cracking is normal natural process in beams as wood driest to average room humidity. The tried and true methods of timber framing are still being used and can be incorporated into many home designs. Homestead will custom mill Fir, Tamarack and Pine into beams used as structural members. Exterior post and lintels are more economical using solid beams compared to using framing lumber and then wrapping them with hollow beams later. Solid Beams add a look of strength and stability to your home.